I found these great new Hershey's Raspberry Hugs at Target the other day. They are milk chocolate kisses hugged by a raspberry flavored white cream. Hmmm? Chocolate and raspberry? Why, yes I took a bag home. I was smart enough not to open the bag till I was ready to bake with them. As soon as it was open the little vultures that reside in my home were circling the kitchen waiting for me to throw them some. My two year old really liked them. He kept asking for more "chocoleelee". That is what he calls chocolate. Most of his other words he enunciates very well, but it's cute when he mispronounces some. I was really happy with the way my Candy Cane Hot Chocolate Rice Krispie Treats came out with the Candy Cane Kisses, so I employed the same method. I used Cocoa Krispies and hot chocolate in the mix. I just chopped up the Raspberry Hugs into small pieces with a knife. I might have eaten a few pre-cut ones. 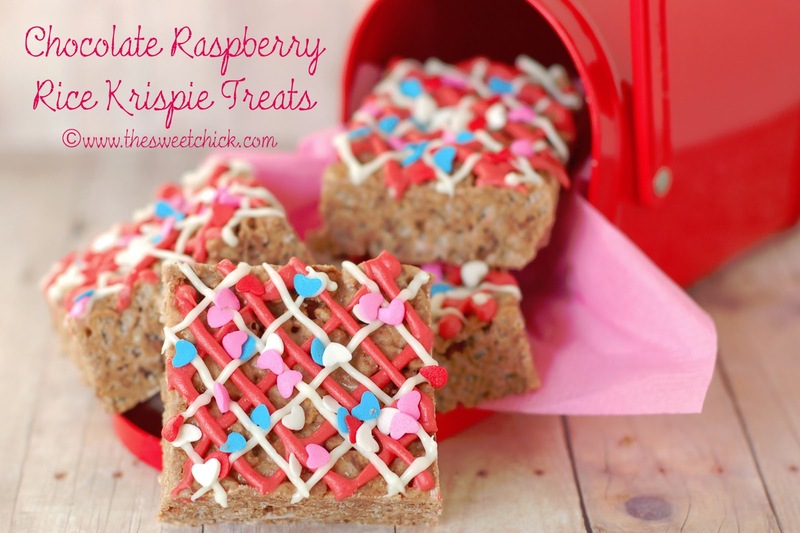 I made some of the Rice Krispie Treats into bars and decorated them with Wilton's red and white candy melt and sprinkled them with some cute little heart sprinkles I found in the $1 bins at Target. But I also wanted to create something a little more festive to Valentine's Day coming up. I pulled out my Wilton's 3 inch heart cookie cutter and cut some of the treats into heart shapes. And put them on some striped paper straws and decorated them with some red and white candy melt also. I used Wilton's #5 tip to pipe in the outline and fill in, then I used a #2 tip to write the words. This is great for a party at your kids school or just for your loved ones at home. A little something extra special is always nice to receive. 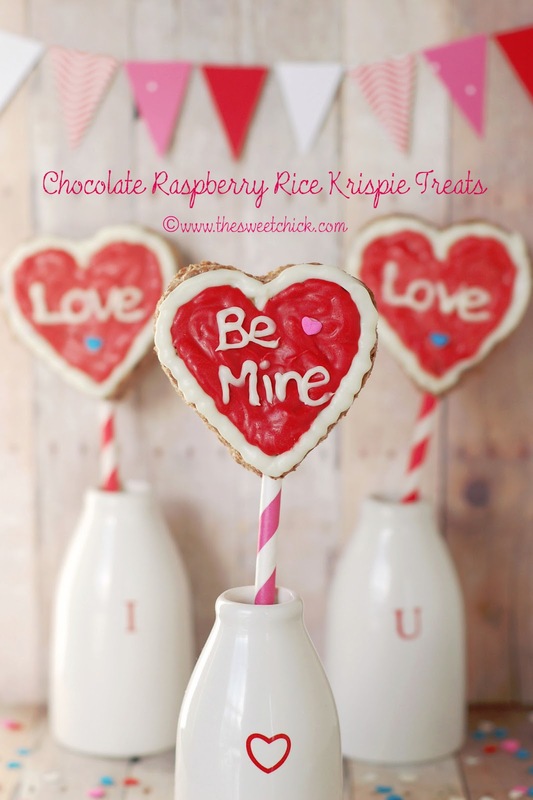 Then add the Cocoa Krispie cereal and chopped Raspberry Hugs. Mix until all is well incorporated. Melt red and white candy melt according to instructions on package and drizzle over the cooled treats using Ziplock bags with the tips cut off or Wilton's disposable decorating bags with a Wilton #5 cake decorating tip. Then add sprinkles before the candy melt hardens. 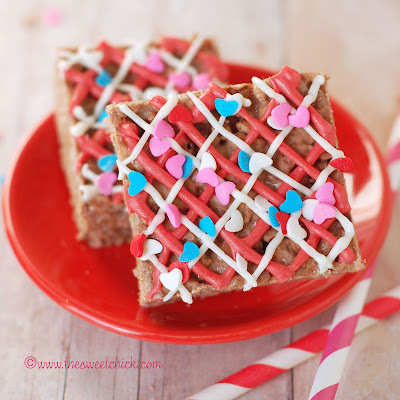 Once candy melt has set, cut treats into squares and keep in an airtight container. These are SO gorgeous. Your photos are so pretty! Thanks. I was just looking at your Maple Glazed French Toast Donuts. Those look amazing. So pretty and fun! When I was at the craft store, I saw that Wilton had some Raspberry flavored Chocolate Candy Melts. The added Raspberry would put this over the TOP! And I love the little milk jugs! Thanks. Yes i saw the new candy melt after I made my treats. I will have top buy some and make something else. Your creations are beautiful! Found you on Tasty Kitchen. Love your blog! Have a wonderful week. Thank you Tricia. You have a beautiful blog as well.